Luton Town are back in the third tier of English football for the first time in 10 years as Olly Lee's second half equaliser sealed promotion to League One with a 1-1 draw at Carlisle United this afternoon. It had looked like the visitors, who went into the game knowing a win would do the job, would have to put their party on ice, trailing 1-0 at half time and seeing Exeter turn around a goal deficit to lead 2-1 against Crawley. But in the space of 60 second half seconds, that all changed, as Lee levelled for the visitors, while Harry Kewells' Red Devils side equalised at St James Park, ensuring Luton would be up. That they were at a sun-drenched Brunton Park to the delight of nearly 1,500 fans who had made the long trek up. Hatters boss Nathan Jones named an unchanged team for the third game running, but witnessed a disappointing opening 20 minutes where his side struggled to get going. Mike Jones tried his luck from 25 yards, James Shea behind it comfortably, with the Hatters keeper then repelling Jamie Devitt's long ranger. Town were behind on 12 minutes when Richie Bennett was played in by Ashley Nadesan and went to ground over Shea's challenge, with referee Sebastian Stockbridge awarding a penalty. United skipper Danny Grainger made no mistake from the spot, sending Shea the wrong way to quieten the packed away end. As news of a goal for Accrington at Wycombe filtered through, the hosts threatened again, Clint Hill's header from a corner straight at Shea. The veteran was then involved in a tussle with Hylton, both players spoken to by Stockbridge, as Luton finally had a spell of pressure, pushing United back. Hylton's touch was just off, Clint Hill clearing, as Dan Pott's effort was easy for Jack Bonham, who then denied former Cumbrians player Jack Stacey, with the rebound hacked away from inside the six yard box. Hatters were close again when Alan Sheehan's freekick caused havoc, with cries for a handball, as first Hylton, then Olly Lee and McCormack all had efforts blocked away by some desperate defending. James Collins tried to pick out the bottom corner, his low shot deflecting behind, as Town trudged off, still in a position of ascendancy with Exeter being held by Crawley. In the second period, Pelly-Ruddock Mpanzu went close early on, teed up by Collins, his angled drive from 18 yards flew narrowly wide, while elsewhere, former Hatter Jayden Stockley put the Grecians in front. 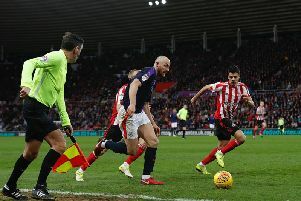 However, a crucial few moments saw Jamal Campbell-Ryce dink over a cross which flicked off Rea's head meaning Bennett could only shoulder it wide. Town then attacked as they got the goal they desired, Hylton's cross-shot parried by Bonham where Olly Lee kept his cool to tuck home left-footed and send the travelling support into raptures. Lee's strike took on even more significance with news of an equaliser for Crawley making it 2-2, the point would have been enough for Luton to go up. After the goal, Luton defended impressively, repelling a number of corners, importantly always remaining a threat when possible. Stacey set off on another superb run forward, scattering challenges as the ball rebounded into the path of Mpanzu who had almost given up, only to be faced by Bonham, the keeper saving well. Jamie Devitt was inches away from throwing a massive spanner in the works on 80 minutes, arrowing a low shot just wide, Shea left rooted to the spot. Olly Lee them almost had a stunning second goal, unleashing an instinctive 20-yard volley that just didn't dip in time. Luton kept looking for the goal that would take any other result out of the equation, Olly Lee over, and then Mpanzu heading into the ground and on to the bar from Potts' excellent left wing cross. With Exeter's result confirmed, a huge roar went up from the away end, as they knew Luton were up as long as they didn't concede again. Late on, United sent Bonham up for a corner, but it was flicked over the bar and the final whistle went, leading to wonderful scenes of celebration between both players, management and supporters, as Town could finally celebrate a job well done. United: Jack Bonham, Danny Grainger (C), Luke Joyce, Mike Jones, Jamie Devitt, Jamal Campbell-Ryce, Richie Bennett, Mark Ellis, James Brown (Tom Miller 72), Clint Hill, Ashley Nadesan (Kris Twardek 72). Subs not used: Louis Gray, Tom Parkes, John O'Sullivan, Reggie Lambe, Cole Stockton. Hatters: James Shea, Jack Stacey, Dan Potts, Glen Rea, Alan Sheehan (C), Alan McCormack (Johnny Mullins 90), Pelly-Ruddock Mpanzu, Olly Lee, Elliot Lee (Flynn Downes 90), Danny Hylton, James Collins. Subs not used: Marek Stech, James Justin, Luke Gambin, Jake Jervis, Harry Cornick. Booked: Potts 44, Ellis 44, Grainger, Bennett. Hatters MOM: Alan Sheehan. Marshalled the defence superbly.